From the unique luxury of the 370Z Roadster to the family friendly versatility of the Pathfinder, Nissan has produced some truly fabulous rides. Known for crafting vehicles that place an emphasis on quality and reliability, the Nissan name means a vehicle that’s built to impress both visually and structurally. This Japanese manufacturer offers a wide range of flavors, from the popular Murano SUV, to the incredible GT-R supercar, to the all-electric Leaf. No matter what kind of Nissan you drive, you can rest assured that Menke’s is well-equipped to keep it in perfect condition. Menke’s uses the most cutting edge technology on the market for Japanese car repair. Regular training in the newest equipment, makes, and models of cars ensures that our technicians remain on top of the constantly evolving field of automotive repair and service. That’s why whether you drive an Infiniti or a GT-R, you know we’re always ready for your Nissan. Beat dealership repair quality with a more reasonable cost. Keep your Nissan running in factory new condition. 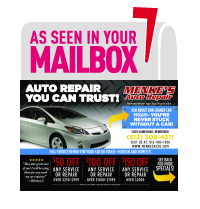 The Menke family has been in the auto repair business for over 40 years, and in that time, we’ve built a reputation of excellence in the Evansville and Newburgh area. From an Angie’s Gold Award for Super Service, to a Best Dressed Shop Award, to 2014 Best Facility Award, to Motor Age cover story “Top Shop in the Nation,” Menke’s has proven itself as a purveyor of Southern Indiana excellence year after year. That’s why most of our customers are customers for life. Get a free loaner car, relax in the finest waiting area that the industry has to offer, and say hello to our friendly staff. With superior service and competitive pricing, there’s no reason to go anywhere else. What will you say about Menke’s? Find out why we’re leading the way in automotive service and repair.